One more issue, and Secret Avengers sadly comes to an end. Things start off with the kind of scenes that make this comic unique and fun: In a flashback, the Secret Avengers team is hanging out in a SHIELD helicarrier break-room. It’s perfectly bizarre looking at Hawkeye, Nick Fury and Coulson hanging out a table with a sentient bomb and an alien killing machine, while MODOK bores them all with a wordy “infodump” that kind of explains the plot. That plot: stop MODOK’s former assistant, Stamper, from wiping out our world by bringing some nightmare world here. Stamper’s plan is already underway though, and things are looking bad. Enter Jessica Drew, the original Spider-Woman. I haven’t been overly fond of Jessica lately. She comes off looking thoroughly unpleasant in the first issues of her latest self-titled comic and Spider-Verse. Here in Secret Avengers though, she’s far more likeable and effective. Using a new power(?) she looks in Stamper’s mind to find out why he’s following his twisted path, and as a result, manages to at least delay doomsday. We don’t see what Jessica sees inside Stamper’s mind, but it’s pretty dramatic. There’s only a few words of dialogue in this scene, but it and Michael Walsh’s art throw a pretty emotional punch. Just reading those couple of pages makes me wish Ales Kot and Walsh were handling the current Spider-Woman book. Even when I don’t entirely understand everything that’s going on in Secret Avengers, I still love it. There’s some fairly weighty things going on here in regards to reality, love and what it means to be heroic. On top of that we have a super-villain motivated by what appears to be some pretty horrible past bullying. All of this was preceded by issues dealing with PTSD. Like I said, pretty weighty stuff. At the same time though, this is a funny and delightfully bizarre series, and this issue keeps those attributes going. Kot has a great handle on these characters. MODOK in particular has been an incredible addition to this Avengers team, and hopefully Marvel won’t turn him back to super-villainy once this series ends. Also, props again for his portrayal of Jessica Drew. I’ve mentioned Walsh’s art, which looks great. His work along with Matthew Wilson’s colors combine to make a unique and very fitting look to Secret Avengers. Marvel is looking for more diversity in its comics, to include a greater number of women characters in higher profile books. While that results in us getting a new Thor and yet more Spider-Women, Marvel all but ignores some of its most enduring and interesting women. In just the last month, She-Hulk and Elektra have been cancelled. 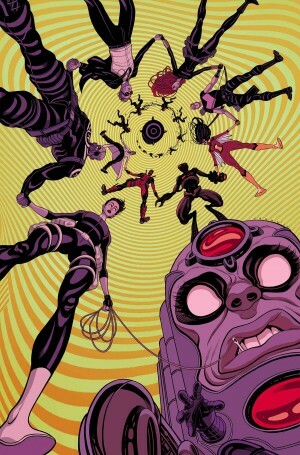 Now, Secret Avengers is one issue away from the same fate. It’s a shame because this is a sharp, humorous, occasionally dramatic book with some pretty impressive female leads. I love Silk and the new Thor comics, but here’s a great comic with existing heroines (both super and non-super) being portrayed in a positive and strong light. As I mentioned earlier, Jessica Drew comes off more relatable and effective here than she has over the last several months in her more mainstream appearances. Then there’s Maria Hill. One of the Marvel Universe’s more influential figures could just as easily star in a SHIELD comic over a character like Coulson. I guess what I’m trying to say is that Marvel has lots of great women in its library of characters, and I wish they would better use them. On top of that, I believe cancelling books with strong female leads like Secret Avengers, She-Hulk and Elektra seems to contradict Marvel’s diversity goal. Of course, I suppose this rant could just be my small tantrum in response to some of my favorite books getting the axe recently. Anyway, rant over. The only negative thing I can say is that this comic is coming to an end. When it comes to Avengers books, I think I prefer this group of characters overcoming the drunken, unwitting villainy of MODOK over billionaire douchebags and gods of thunder fighting Ultron or Doctor Doom. Hopefully Secret Avengers or a book like it will return once Secret Wars wraps up.